After being occupied for a couple of weeks by the founding of our cooperative (A Bunch of Hacks), we have turned our focus back to improving Epicinium and today we released beta version 0.25.0. This update introduces weekly challenges, new dust and grass particles, and an easier way to provide feedback directly from within the game to our STOMT page. Starting this week, a new challenge will appear in the game every one or two weeks. Completing challenges awards you with stars, and you can play a challenge again to try to get a higher score; your best attempt counts. The stars you accumulate over the weeks are added up and displayed next to your name in the multiplayer menu. Challenges are played on special maps against a special AI. Some challenges may have different starting units or rulesets as well. 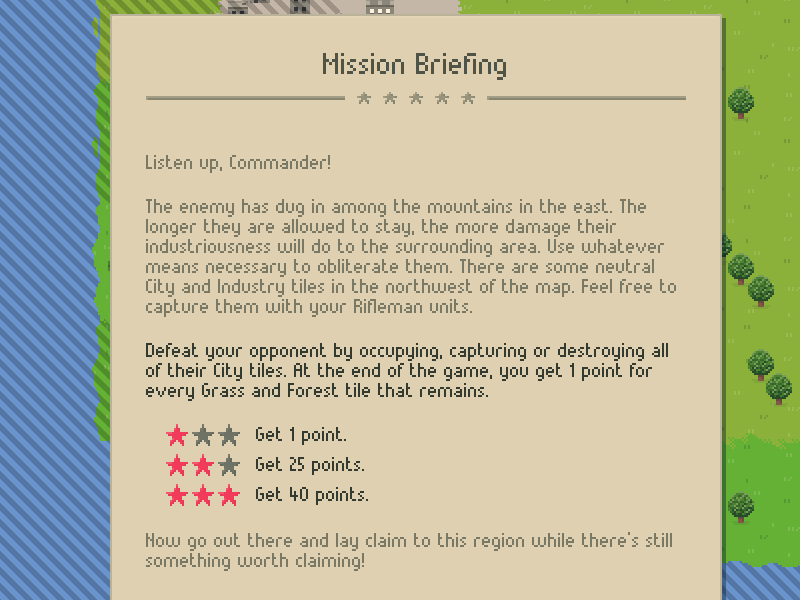 A mission briefing appears at the start of the challenge to tell you what you need to do to earn stars. For this first challenge, the objective is the same as in any other game of Epicinium: occupy, capture or destroy all enemy City tiles and try to keep as many Grass and Forest tiles intact to get a higher score. If you score at least 1 point at the end of this challenge, you will get 1 star. Scoring at least 25 points gets you 2 stars and scoring at least 40 points gets you 3 star. Instead of starting with two City tiles, you start with three Rifleman units and a Farm tile. This challenge is played on a very small map, so expect global warming to grow out of control really fast. Getting all three stars is meant to be very difficult (it's a challenge after all), but definitely possible. Let us know what you think, either by commenting here, dropping by our Discord or from within the game using the new feedback form.